Landscape Use: Large scale ground cover, espalier, large informal hedge. Best with forced containment such as a raised planter. Growth Habit: Is able to brambles to 50 to 100 feet, else wise can maintain as a 4 to 8 feet shrub with frequent hard pruning. Foliage/texture: Pinnately compound leaves with dentate margins, glabrous with prominent veins, gray stems; medium texture. Flowers & fruits: Brilliant tubular orange to vermilion flowers to deep red 2 inches long flowers in terminal cluster. 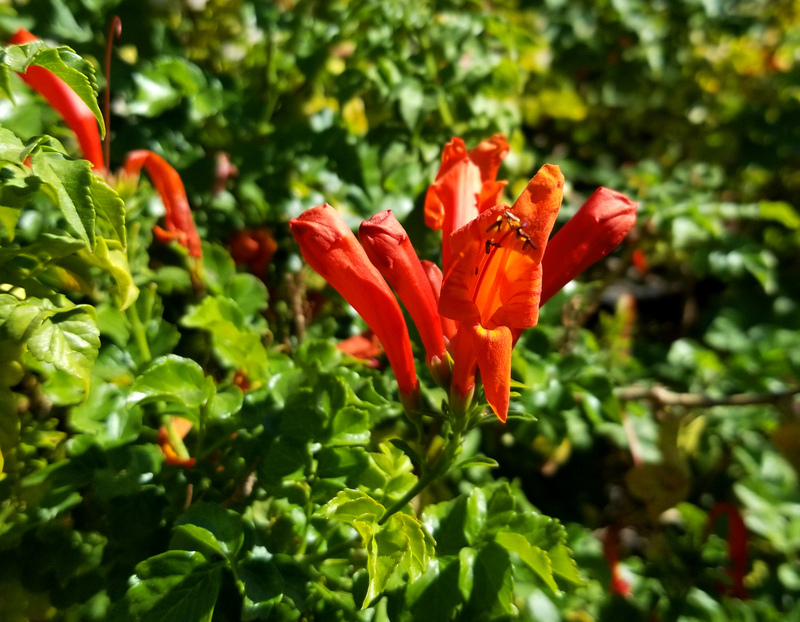 Flowers more red in cooler in cooler climates fading to orange in warmer climates or as the weather warms. 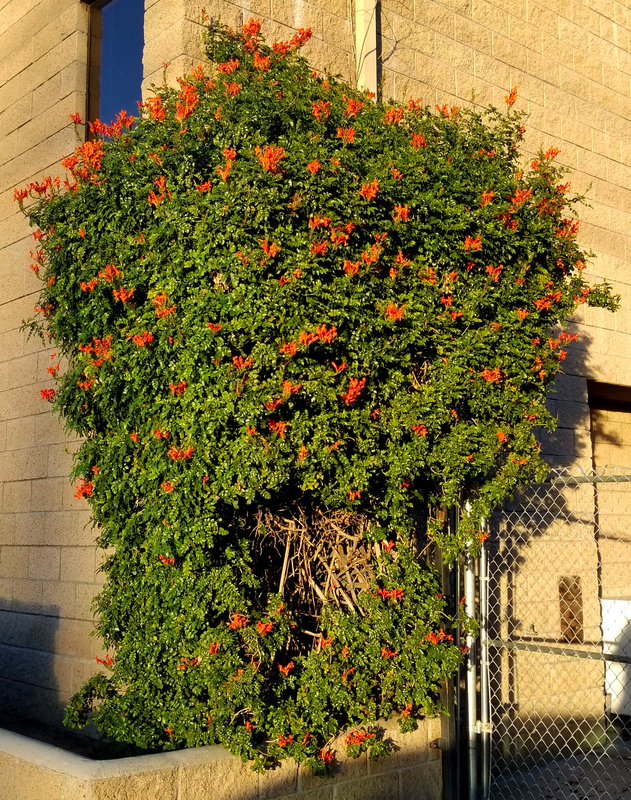 Seasonal color: Brilliant orange to deep red during October to March. 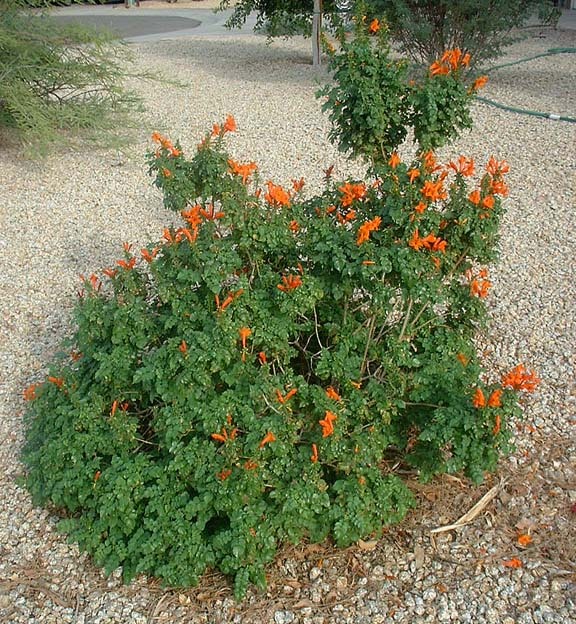 Temperature: In Phoenix, cape honeysuckle is generally hardy having only minor feeze damage during the coldest winters. Avoid the reflected heat of western exposures. Light: Full sun to partial shade, avoid reflected light of south and west exposures. Soil: Tolerant of all but most alkaline soils. Pruning: Requires regular hard pruning except during Fall. Additional comments: Flowers attract hummingbirds. Variety aurea (seldom seen in Phoenix) has yellow flowers and reportedly tolerates more heat. Landscape design warning: Do not ever use cape honeysuckle in combination with Algerian ivy (Hedera canariensis) or other any other trailing ground cover for that matter as this plant will spread rapidly like "The Blob"! Cape honeysuckle when it becomes invasive like "The Blob" is easily killed by use of glyphosate in summer.